So much has been written about children attending worship services that I feel I have little to add. At the same time, parents with young children have many questions and worries about attending church with children. So here goes. Many parents are surprised to learn that children are welcome to attend worship services. Congregations (including the minister) understand that children will make some noise, whether it be crying baby noises or the fidgety noises of school age children. The people who are most distressed by these noises seem to be the parents of the children making sounds. I am always encouraging parents to stay in the service when they unnecessarily feel that they must leave because their children are making sounds all children make. There will be churches where this is not true, of course, and where the people around you are surly about your children. These are not churches you will be interested in attending because they are in decline. How do you know when you might need to step out of the worship service with your child? If your child needs attention that requires you, the parent, to talk, that is a good sign that you may need to step out for a few minutes. And we all know the difference between the cooing and burbles of a happy baby, the grunts and moans of a slightly fussing baby, and the screams and wails of a “something is wrong” baby. The first two situations are no problem–we’re so happy to have a baby in the community!–and…the screaming baby will probably be happier outside the chapel anyway. Some congregations have a “cry room” at the back of the chapel or sanctuary, where parents may sit with children and still hear and see the service. I have heard from some congregants that they viewed a “cry room” negatively while looking at churches; they felt the cry room meant children were unwelcome in the service itself. This is not necessarily so; you will only learn what the congregation’s attitude towards children is over time. Some congregations have outdoor speakers so the service can be heard by those who are outside. Other congregations may have an “overflow room” in the facility where the service can be watched or heard. The congregation may have an activity bag of fidget items available for children attending worship. You may want to bring your own fidget items (books, crayons, etc.). Most services last an hour or so, which is a long time for any child. There will likely be activities your child is welcome to join: coming forward for a story, leaving to join religious education classes. These are good things to ask about in advance, and to talk over with your child before coming. The congregation understands that a child visiting for the first time may want to stick close to parents and hesitate to join in. Parents are usually welcome to attend religious education classes with their children, to help them get settled and oriented. But what if your children are bored with worship? I did not grow up attending church regularly, but I did periodically attend with my older sister. I didn’t want to go to religious education classes, and so I stayed in the service with my sister. I don’t recall liking it or disliking it. I don’t recall anything especially memorable happening. But I do recall the pleasure of being with my sister, of feeling loved and protected, like my sister was happy to have me with her. I understand that parents feel anxious about having children with them in worship. Surely they’ll be bored or misbehave; surely they’d prefer to play outside or be with the other children. And there will certainly be times when all those things are true. But in our very hectic and over-scheduled world, sometimes there is value in just being together, in knowing you’re sitting with your family and that you love and care for one another. Worship is one of the places where that kind of closeness can happen. 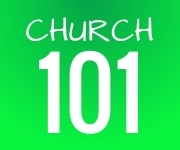 One Response to "Church 101: Children in Worship"